It is rare these days that I cover someone for the first time who is genuinely a step above their peers. Yet such is the case with Lavabre Cadet. I had known of the French glove maker for several years, but never met and talked to them in person. And it was only when I did that I appreciated everything that goes into making their product. 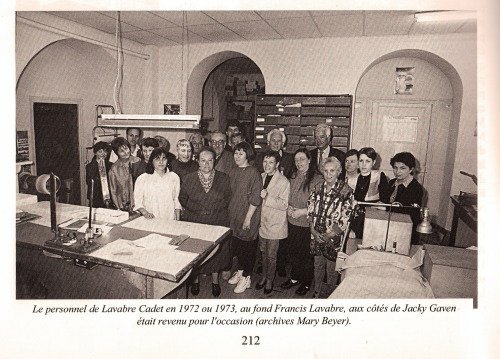 Lavabre Cadet was founded in Millau, France in 1946 by Francis Lavabre and his wife (the ‘cadet’ is a French nickname used for the youngest in the family). 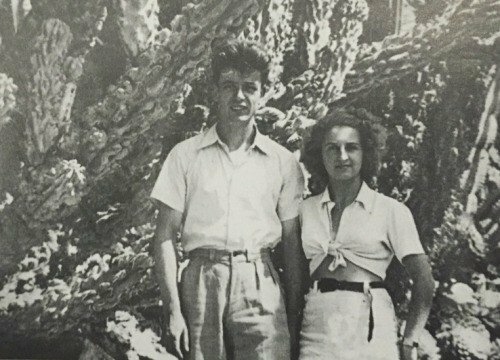 Lavabre used to run another atelier, and he and his wife made a good team – she was a pattern maker and designer, he a maker and manager. From the start, Lavabre Cadet focused on bespoke and haute couture. This is unusual among glove makers, most of which have always made big runs and often had army or other large-scale contracts. So, what sets Lavabre Cadet apart? It’s partly materials and partly workmanship – with the latter a lot easier to illustrate. 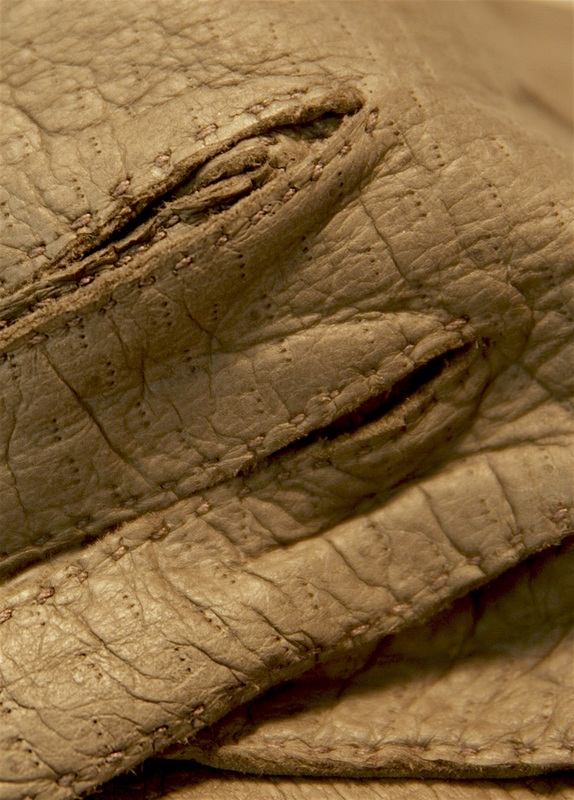 Any glove that is handsewn has the stitching clearly on display. The more stitches there are, the finer the work is. I compared the turned-back bottom edge of my Merola and Thomas Riemer gloves to those of Lavabre (above) and found the French maker had around 40% more. This isn’t necessarily a practical point; I have never had these stitches on any glove come apart. But rather like fellow French makers Cifonelli or Heurtault, it is the finest product I have seen. 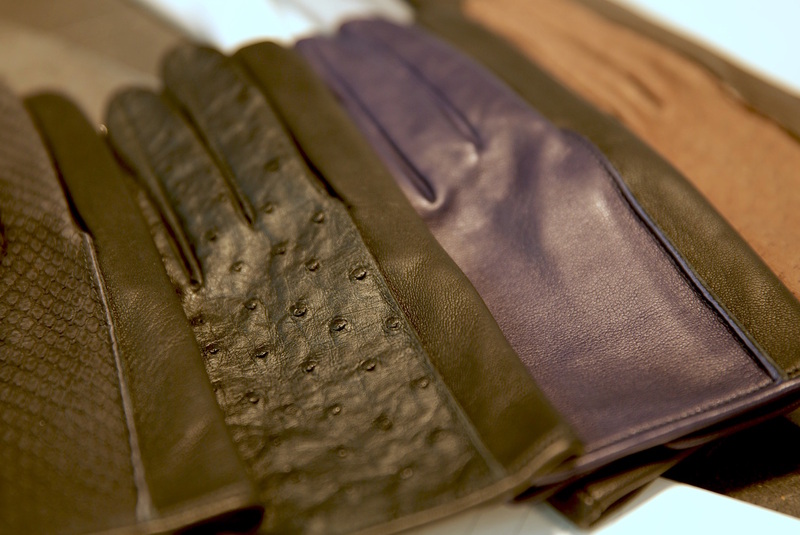 Like most high-end glove makers, Lavabre doesn’t use any glue in the lining of its gloves. So the silk or cashmere lining is made as a completely separate glove, and stitched in on the tops of the fingers and under the turned bottom edge. If you pull at such a lining, you can see whether the stitches move (showing they are holding the lining) or not (showing it is glued). As with most things we discuss here on Permanent Style, from suits to hats, using less glue and more stitching allows the piece to be more easily repaired. Each glove is made of a two-piece paper pattern, rather than three. The front and back are joined along one edge (below the little finger), meaning there is one less seam. An extra piece is required in both cases for the thumb. The cut edges around the fingers (when stitched on the outside, rather than the inside) are noticeably finer. You can see that on the grey pair shown here, and for me it’s a great mid-point between inside stitching (which can look effeminate) and normal outside stitching (which can look a little rugged). 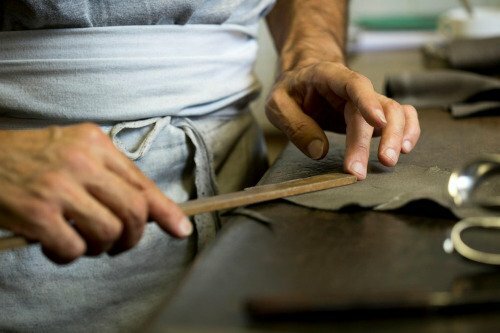 A lot of time is spent in the workshop stretching the leather before cutting it. 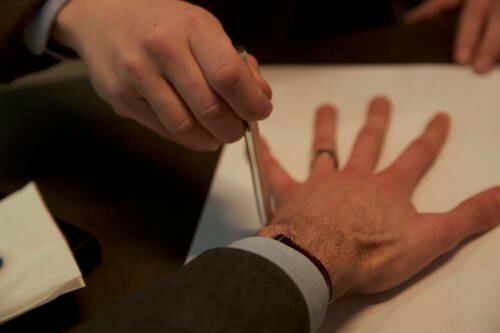 This means that fingers, for example, actually shrink a bit during wear, settling at the point where your fingers end. And, on the flip side, they don’t stretch out of shape over time. Not exactly craftsmanship, but Lavabre Cadet do quarter sizes. Which is useful, as it turns out I’m an 8 1/4. The second area of quality is materials. This is less of a discrete comparison, more an continuous one. So Gaziano & Girling uses better upper leathers than Cheaney, who in turn uses better ones than Barker. But you can’t put a figure on it, you can’t (initially) point to the difference. To an extent, it’s a hidden benefit that only reveals itself over years of wear and polish. 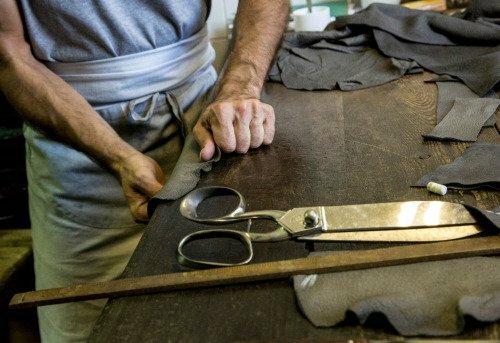 With gloves, the quality of materials also varies year-by-year (deerskin is harder to come by at the moment), is subject to long-term trends (supply is being squeezed as luxury brands buy up tanneries) and can vary with silly things like colour. My cork-coloured peccary from Merola is not as soft as my brown-coloured peccary, for example. But even with all these caveats, Lavabre Cadet is at the top of the tree. I have never felt peccary as soft as malleable as the grey models shown here. The same with the suede calfskin. And the house has always been known for its kidskin, which is very rare (though still offered by A Suitable Wardrobe – I have the brown suede). As with shoes, this quality of materials and craftsmanship shows itself over time. 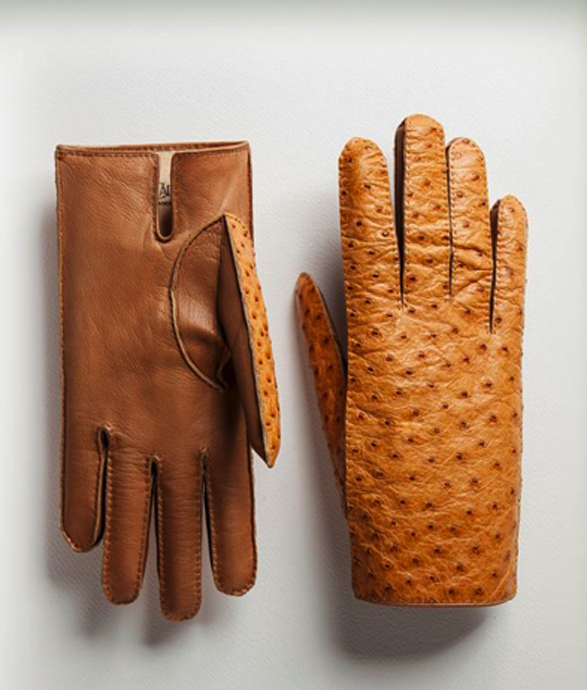 Friends such as Jean-Baptiste Rosseeuw, who now works for Lavabre, and Guillaume Clerc of Maison Bourgeat, both showed me their well-worn gloves the last time I saw them in Paris – and frankly I almost ran away with them they were so lovely. I am ordering my own bespoke pair (measuring shown above) to try and prevent similar kleptomania. Lavabre Cadet has had several ups and downs in recent years. It was owned by Marie Beyer for a while, with the brand changed to her name and the product pushed towards womenswear. In 2012 it was bought by the current owners, leather company Camille Fournet, which should provide a good home. They are effectively just starting in a new direction, with bespoke and MTO available on request (you can email Jean-Baptiste at jb.rosseeuw@lavabrecadet.com) and starting to talk to potential retailers for RTW. Fortunately the workshop has remained unchanged throughout these decades of change. 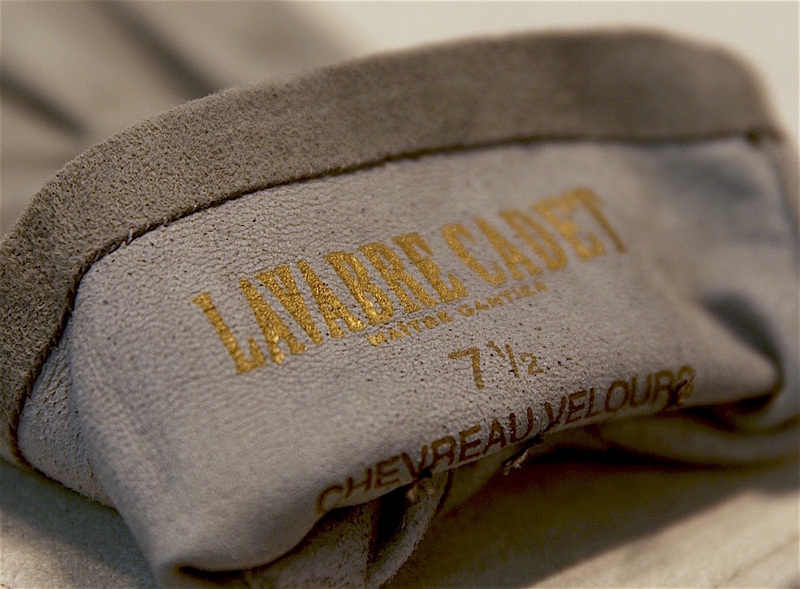 I dearly hope that whatever happens to Lavabre Cadet in the future, these artisans continue making their superlative gloves. Prices: Made-to-order from €225, with lambskin €300 and peccary €800. Bespoke from €530 (often requires a fitting). RTW not currently offered. *There’s an interesting side point here about the difference between ‘bespoke’ and ‘haute couture’. Bespoke is about making something specific to the individual, to their fit, lifestyle and specifications. Haute couture, on the other hand, is primarily about design – about starting with a blank sheet of paper and letting the imagination run free. This is how Lavabre Cadet and others that make at this level differentiate between the terms. But of course with most menswear there is no difference, simply because men don’t want to create something fantastically original. They want subtle, sophisticated style, and ‘bespoke’ is enough to capture that and the occasional dalliance into bright cloths or unusual lapels. You can follow the discussion on Lavabre Cadet glove maker, Paris-Millau by entering your email address in the box below. You will then receive an email every time a new comment is added. These will also contain a link to a page where you can stop the alerts, and remove all of your related data from the site. 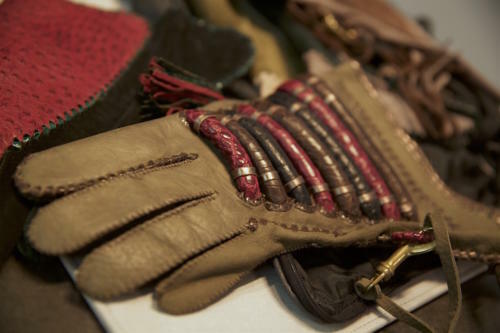 What do you think about the other glove makers based in Millau, such as Maison Fabre, Causse and L’Atelier du Gantier ? Causse (owned by Chanel) is the only one really at Lavabre Cadet’s level. Maison Fabre is a decent quality but not the same, and not all made in Millau. L’Atelier du Gantier is very small and was taken over a few years ago – doing some interesting things, but again not the same level. The only other comparable maker in France is Saint-Junien, which is owned by Hermes and making only for them. Last week, when I was on the Camille fournet site, there seemed to be the RTW Lavabre Cadet gloves available to buy… Not sure if that’s changed? Lovely products all the same though, and one I am seriously considering to purchase! I have gloves from Dent which I really like,but made the switch to Merola in large part based on your analysis. The change was worth it as Merola is clearly a better glove, at least to me. I must admit that I find it hard to believe there’s a better glove maker than Merola, but you’ve found one! This is Permanent Style at its best, thank you! Simon, you should treat yourself to a fantastic pair of bespoke cycling gloves – for those long days in the saddle. What a fantastic article. I’ve been a long time reader of your website. I’ve had experience with Maison Causse and have noticed a similarly incredible attention to detail. Second to this, after reading this I intend to visit the sales point in Paris with interest in the MTM line – the price point seeming to be very fair. Just wanted to let you know that I have had my first pair made in a beautiful brown lambskin upon discussion with Jean-Baptiste. The handiwork is impeccable, including both the hand stitched areas and the internal interior stitching along the fingers, which I understand is particularly hard to do with the machine. The fit is also superb and I intend to order another pair or two from the house. Simon, any comparison notes to Chester Jefferies, bespoke glovemaker from the UK? Simon, what’s the price range for bespoke gloves? Let’s say the material is peccary. Thanks. Sorry I just saw the price. Please reject my posts. Thanks. Peccary varies a lot in quality, so there’s a big variation between makers. Also a bit of controversy as to whether some of the skins being used are actually peccary. Hi Simon, I wonder what glove colour do you recommend to burgundy shoes like the horween colour 8? I had once the stitches come apart from my gloves. There were from a reputable english maker.,I was not happy about it but the company changed them immediately. Also, I have a friend who bought its gloves from Saint Junien by calling them, sending them a print of his hands and choosing the materials, what I would call a “loose” MTO. It was a few years ago, but they were not advertising this possibility then, so it might be still available (they were already producing for Hermes). From memory prices were just a bit higher Merola/Dents offers. Just to be clear, I do not think that this was equivalent to their Hermes production, but the gloves were very nice. I have a gorgeous pair of dark blue LC gloves in kidskin — exquisite, and certainly superior to Merola. But an excellent value is found easily in UK Dent’s extensive line. Beautiful fit and workmanship and an ever-innovating selection of colours and skins. The texture of the gloves in the first picture is gorgeous! What kind of leather is it? Oh dear… I was hoping it would be something cheaper. Thanks! The best deals on quality peccary gloves can be found on eBay from seller leathergloves2013. I have several pairs from him, all good. Many may disagree, but I find it absolutly ridiculous to pay €800 for a pair of peccary gloves. Peccary is actually a realtively inexpensive hide. It is not commercially farmed and comes primarly from wild caught Peruvian peccary. Perlinger in Germany is a wholesaler of CITES approved peccary and is the main supplier for most European glove makers. Many of these glove makers make white label gloves for many fashion brands. You may often find their tag on a new pair of gloves. There are many glove makers in Romania and Hungary, Hungant being one, that produce top quality entirely hand sewn gloves using Perlinger peccary for under €200. You can also send them a scan of your hand and measurements for superior fit. At €800 you are just paying for the experience and name. Several manufactures seem to price their Peccary glove offerings at 500% more then kid skin, doe skin, and other hides. It makes little sense. Are they trying to capitalize on the luxurious reputation of peccary leather? It is nice, but should never cost more then other hides. It is no more difficult to work with and the hides are plentiful and inexpensive. I’m afraid this reflects a misunderstanding of the quality levels of peccary, which vary hugely. To clarify, in the context of mens wear, “fashion brands”, was meant to describe the likes of Brioni and Kiton. There is no doubt that Lavabre Cadet makes an amazing pair of gloves, but as mentioned previously, Hungant, Paula Run, Chester Jefferies, and many other makers all do as well. They’re all around €120-€300 and offer made to measure. With gloves the issue for most people, including myself, is certain fingers are either too short to too long. 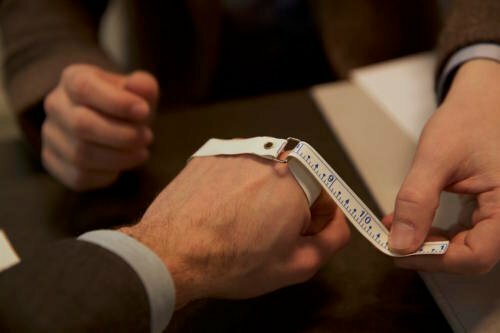 It is very easy to measure finger length and palm circumference, compared to say measuring yourself for a shirt. Therefor it should be fairly easy to get a perfect fitting glove. In my experience there is very little quality differentiation with Peccary hides from various glove makers since most purchase their leather from Perlinger. The color is always consistent and there are few, if any, natural blemishes such as bug bites and scars that occur on hides sourced from wild animals. They are not on par, but there is little difference, certainly not €600 difference. A good fitting glove made of good quality Peccary is sufficient. I know that this is subjective. I have pairs of gloves from Merola, Chester Jefferies, and Hungant. The CJ and Hungant fit best as they were MTM. The fit is perfect the quality is great. 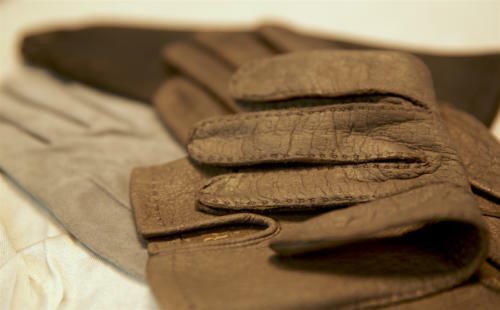 The gloves are entirely hand stitched and their Peccary and Caprincho are both free of blemishes, stains, and scars. The pair from Merola are equally as good in quality, but have poor fit. I don’t have first hand experience with many glove makers, so I cannot comment specifically to what you write, PSNY. My observation is that as one approaches higher levels of quality, the incremental cost for additional quality rises exponentially. Hence why maybe a 10% difference in quality of peccary may be a 300% difference in cost. It then becomes a question of whether the cost is worth it to you. That is a personal opinion. Clearly, it appears not to be worth the cost for you; it seems as it likely is for Simon (given he bought a pair). In general, this blog probably discusses items that only a small segment of the population are going to be willing to purchase, given the quality to value ratio is probably very low, though the total quality will be superlative. I’m generally not in the camp that is going to buy what’s discussed on the blog, but I wish all those who do that they enjoy their purchases. Easy question here – what is the pronunciation for Lavabre Cadet? Any idea who makes gloves for Loro Piana? please How do these gloves compare to Lavabre-Cadet? I have been working as sewer since 2000. I have good experiences sewer particularly on leather gloves. If some entrpreneur looking for good experienced employee on leather gloves sewer please contact me. I am looking for leather gloves sewer job around European country. Looking forward to hear from someone. Thank you in advance. Maybe you already know that Causse and Maison Fabre, both in Millau (France), are looking for sewers for their workshops in Millau. By now, april 2018, they may have an opportunity. Both have needs for piqué anglais (intricate piqué seam) and “brosser” (or whipstiched). Names of seams may vary among glovemakers (“brosser” is an internal seam), sometimes it’s confusing.